That word can sum up the last few weeks of running. I’ve had one good run in the past three weeks since my wisdom teeth extractions, which was oddly the longest run I’ve been able to manage in the past month (8 miles). Basically, ever since my the surgery, I haven’t been able to get into a good running rhythm. The last slump I remember of this caliber was right after I came off of LHR training last fall. That slump lasted about 2-3 weeks but I’m not sure of how much of it was caused by the August humidity. I certainly can’t blame this one on that, even though it has been warming up. You’ll notice that on my 3/3 run I noted that I was having some calf issues. That hasn’t gone away and may be contributing to the slump. I can’t tell. It mostly feels better when I’m running, although my leg feels a little heavy. I can’t imagine it being an overuse injury since my February mileage was so low. Either way, I’ve decided for this week, at least, I’m going to cut down to three runs: Tuesday/Thursday/Saturday. I’m also trying to walk more on non-running days, since it helps my calf feel better. I’ll reevaluate on Sunday morning if I want to try for a fourth. And then I’ll evaluate what I want to do next week. I just want to get out of this slump so I can continue with my half training! Go away, winter. You are ruining my training. So, Nashville had another winter storm come through. We actually got about three inches this time (and less ice than last time). But this means my Wednesday and Thursday runs were thrown out because I wasn’t driving to the gym in all that. On top of that, the race director of Tom King made the call to cancel the half marathon on Saturday because the greenway is completely iced over and unlikely to melt before race time. They are giving us some sort of discount on next year’s race and we are all invited to run the now-modified 5k on Saturday instead. But none of the running through LP Field and finishing on the Jumbotron that I was looking forward to. I understand why he made the call, but it doesn’t make it any less disappointing. 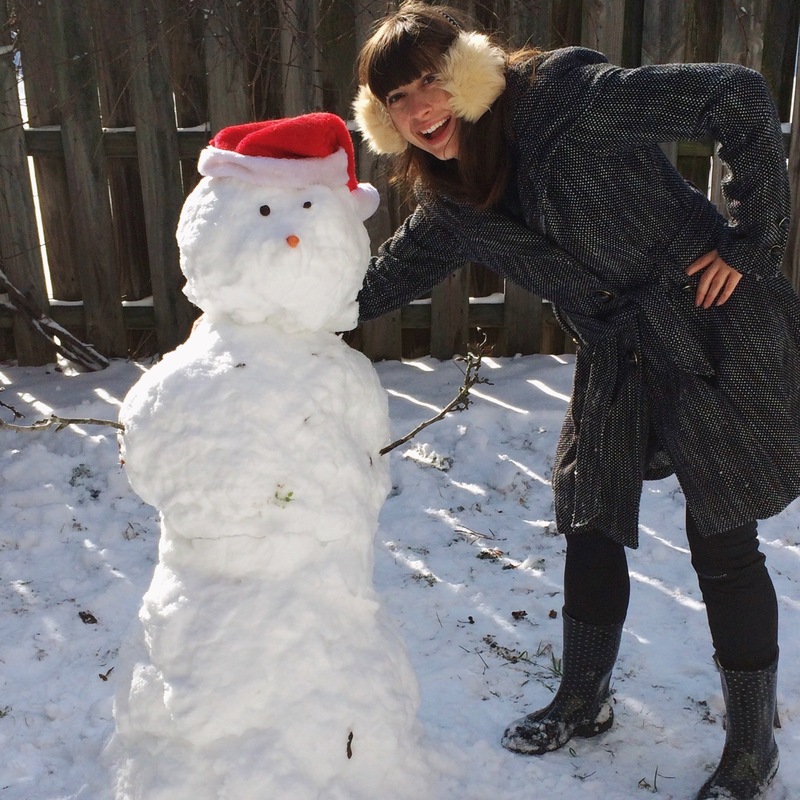 On the upside, Jonathan and I built a lopsided snowman. I’m abandoning my current half marathon plan. It doesn’t make any real sense to continue it. I’ve already met my goal time. Then I ran an even better race the week after. All of that without tapering. And I had to go majorly off my plan anyway, due to a stomach bug, ice/snow, and then getting my wisdom teeth out. It seems like the ideal time to start a new plan, with a new goal. The Tom King Classic is no longer my goal race. It will now just be a fun long run that I will run by feel. I still plan on keeping Oak Barrel easy. 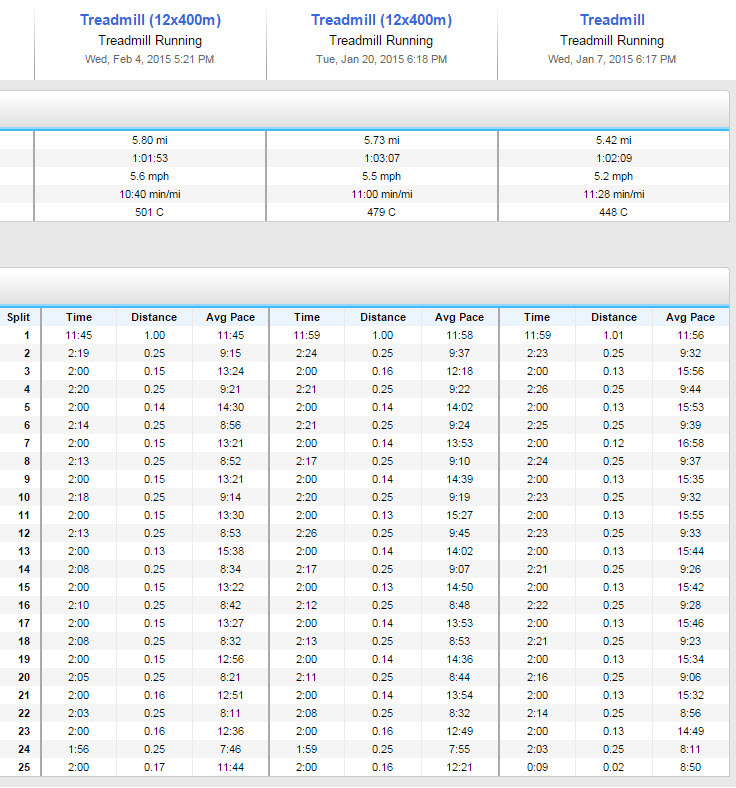 My new goal race is the Kentucky Derby miniMarathon at the end of April. I’m going to aim for a sub-2:10 time. That means running about 15 seconds per mile faster than at Cedars Frostbite, which doesn’t seem too terrible. 04.06-04.12 7x800m 3mi 7mi 4mi Dairy Dash 5k and 10k? My previous monthly best was 101.7 (March 2014).